Ferin, a Ph.D. Candidate in Agricultural Meteorology at Iowa State University, cites an eighth-grade physical science class as the “aha” moment when she discovered her passion for all things Earth-related. Though her first love was biology, Ferin soon realized that her interests included not only the planet’s flora and fauna, but also the physical processes (like climate and weather) that act on them. Upon starting at Iowa State, Ferin married the two realms by pairing a Meteorology major with an Agronomy minor. Pursuing a Ph.D. introduced a newfound passion for teaching, as well as Ferin’s quickly developing research focus: agroecosystem and hydrology modeling. Essentially, she studies water quality through the lens of crop production — how the two are intertwined, and how scientists can step in to make that relationship as sustainable as possible. Ferin and VanLoocke’s research investigates how CABBI’s biofuel initiative could address not one, but two of the world’s most pressing sustainability problems: clean energy and clean water. Research suggests that planting perennial biofuel crops like miscanthus and switchgrass can help meet the nation’s Renewable Fuel Standard (RFS) while also decreasing nitrogen runoff in the Mississippi River system. 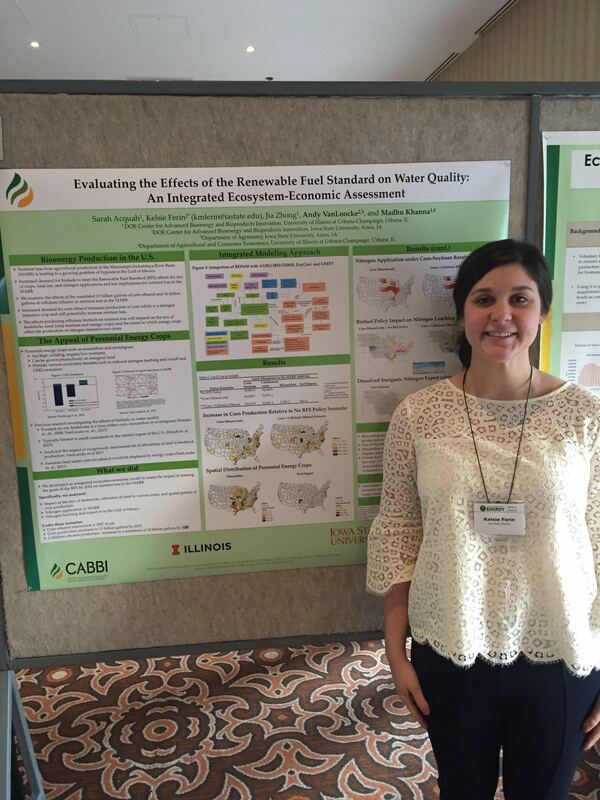 Ferin and VanLoocke’s work with CABBI intends to balance the RFS targets with the EPA’s Mississippi River/Gulf of Mexico Hypoxia Task Force, which aims for a 60 percent nitrogen reduction by 2035. CABBI’s initiative to cultivate biofuels in the Iowan Corn Belt is primed with a built-in method to combat nitrogen. Perennial grasses — like miscanthus and switchgrass — are efficient in nitrogen cycling and have larger root systems and longer growing seasons than annuals. This allows them to absorb more nitrogen and reduce the amount that ends up in waterways. Between land management, crop production, nitrogen, and the water cycle, there are more moving parts to this project than anyone could keep track of, and it just so happens that Ferin’s primary job is exactly that. 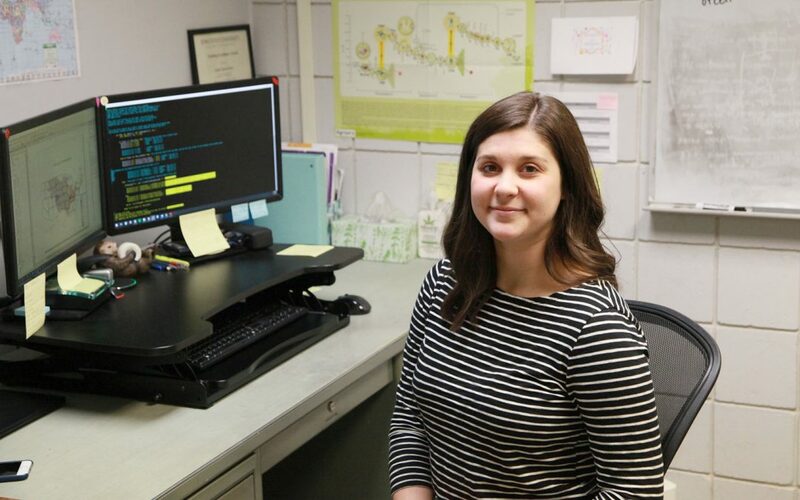 Luckily, she is a coding connoisseur — since picking up Fortran for her Meteorology degree, she has enjoyed refining her coding chops and mastering as many coding languages as she can. Ferin uses a baseline agroecosystem model (created with a program called Agro-IBIS) to experiment with one central question: What do Iowa’s agricultural fields need to look like to yield positive results in the Gulf? She starts by tweaking different factors — photosynthetic parameters, nitrogen fertilizer application, and the allocation of land given to each crop per scenario — and simulating their effects on nitrate leaching, water drainage, and crop and biomass yields. From there, Agro-IBIS output is fed into a hydrology model, a real-world simulation of how water travels through the Mississippi River Basin. The staggering scope of Ferin’s work is anything but daunting. On the contrary, she embraces the opportunity to combine her various interest fields into a cohesive picture. In addition to her interest in the subject matter, Ferin’s motivation to work tirelessly at this project stems from the conviction that her work will be instrumental in advancing the conversation surrounding sustainable agriculture. A Des Moines native herself, the issue of water purification hits very close to home. “It’s the water that my family drinks,” she said matter-of-factly. From a young age, Ferin has been well aware of — and eager to remedy — less-than-sustainable farming practices that have undesirable environmental impacts. Now, she is excited to help revolutionize those practices in the region where she grew up, sparking a chain reaction of sustainability that reaches all the way to the ocean. — Written by Jenna Kurtzweil, iSEE Communications Intern. Photo provided by Kelsie Ferin.